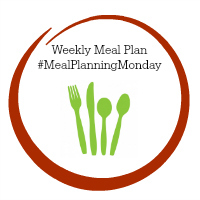 Generally, last weeks meals were perfectly accounted for, which is why we now meal plan. There was one meal we didn't get around to eating but it's been carried over to this week and that was the Risotto. That night ended up with something out of the freezer which had already been made up. This week we are aiming to clear out some of the meat we have stored up in the freezer - which has helped cut the food shop down a little in price. Served with rice and carrot and swede. Such a lovely warming meal whilst so simple to make. This is carried over from last week and makes for a quick and easy meal but on a day we are all around to eat it fully. Jacket Potatoes with a side salad. Wednesdays are such a busy day for us, with the children having swimming lessons, then quickly make them some dinner before I head out to my slimming world class. So this is something I can chuck in the oven and have ready when I return. I'm at work on Thursday so something which we can throw within the slow cooker works best as we all get to eat the same and all have a hot meal each just cooking our own spaghetti. Bacon, Onion and Potato Bake. Again, I'm at work so this is nice and simple to just warm back up in the oven. Served with some vegetables. Something new which we haven't tried before but sounds so tasty. We will probably serve this with a side salad. Roast Chicken dinner stuffed with stuffing. Simply because you cannot beat a Sunday roast and we've not had a chicken in a while. You can see images of all my meals over on my food instagram page here. Last week I filmed a little grocery haul once we had the shopping delivered which you can keep an eye on.